Article first published as TV Review: THE HANDMAID'S TALE Season 2 on Seat42F. Hulu’s THE HANDMAID’S TALE is back for a second season this week. The streaming service released two episodes last Wednesday, with additional installments spooling out weekly over the coming months. The tale of women in a strongly religious, male-dominated society continues, and we immediately get to see different corners of the world than previously shown. Viewers finally witness what life is like at the dreaded colonies first-hand, as well as get a glimpse at an underground railroad-type situation for ladies fleeing their forced fate. Somehow, none of the shock value has worn off, as things get darker still. June Osborne, a.k.a. 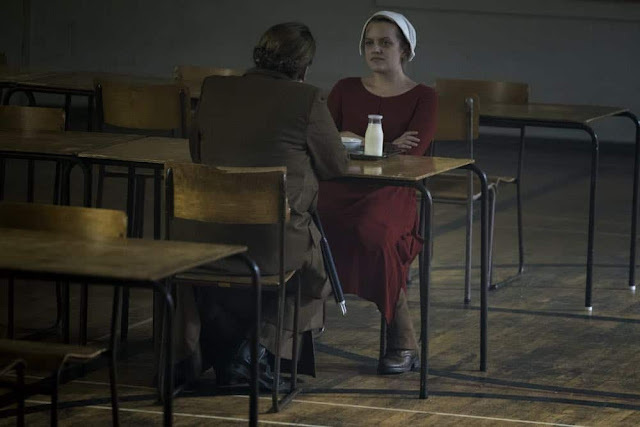 Offred (Elisabeth Moss), is left in a precarious position last season, having led a peaceful protest against Aunt Lydia (Ann Dowd) to save Janine’s (Madeline Brewer) life. Aunt Lydia promised consequences, and they unfold right at the start of episode one. While the actual threat is obviously just that, merely a threat, as fertile women are too precious a resource in this reality to waste, it’s easy to see how the victims of it would be terrified, believing it real. They’ve been treated so poorly and terrorized so much, they can be forgiven for not thinking the situation through logically. June herself, however, is spared as soon as her pregnancy becomes known. This gets into a psychological game, as June is immune from some, but not all punishment, and she is still vulnerable to being shamed in front of the others. Or is she? We know June has a strong fortitude, and her battle of wills with Aunt Lydia, much of it non-verbal, is gripping in this initial hour. June has additional scenes throughout both installments where Moss shines with physical performance and facial expression. Episode two divides its time between some former newspaper offices, where horrible acts were carried out, and one of the colonies, where Emily (Alexis Bledel) has been sent for hard labor. I’m not sure what I pictured the colonies as being like, but the bleak, desolate, radiation-filled landscape is not exactly it. This feels even sadder, more isolated, than I imagined, and life is extremely hard there. A subplot involving a new arrival at the colony (Marisa Tomei, The Big Short) is moving and shocking, but also feels a little bit satisfying, which is needed every now and then in the series. One thing that is different about THE HANDMAID’S TALE from other shows is that it saves all its credits for the end, so you’ll never know which characters will be showing up. This works very well in this particular program, as it allows a larger element of surprise. The end credits also only list the stars of that particular hour, so Alexis Bledel’s name isn’t in the premiere, leaving you to wonder how much she’ll be involved in the season. Similarly, Yvonne Strahovski and Joseph Fiennes aren’t in the second hour, so their names aren’t present. Will they be back? Who knows? There is a freedom for the story to go anywhere without being beholden to past places and characters when even the central cast isn’t listed in this manner. THE HANDMAID’S TALE continues its customary flashbacks in both parts. Normally, this is a conceit in a television show I would grow tired of pretty quickly. And there are times in these initial offerings where it’s easy to become impatient, wanting to get back to the main timeline. However, Emily’s bit in episode two is particularly moving, and both episodes help fill in exactly how this oppressive regime was able to take power, thankfully shown indirectly. It’s helpful for understanding the situation, and also as a warning not to allow current political forces to move in the same direction. It’s uncomfortably easy to imagine how it might. THE HANDMAID’S TALE remains powerful, timely, and intensely compelling. Watch it exclusively on Hulu.